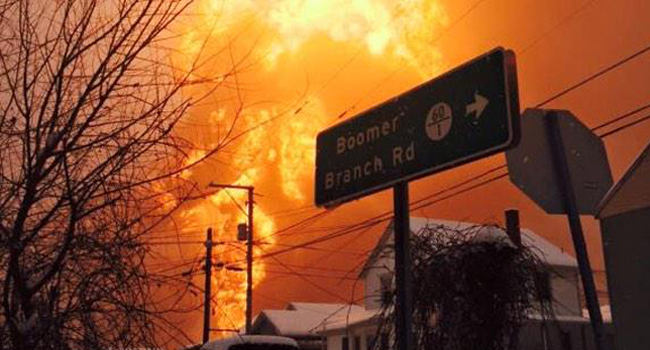 A large-scale cleanup and investigation have launched following the Feb. 16 derailment of a CSX crude oil train near Mount Carbon, W.Va. The train consisted of two locomotives and 109 rail cars traveling from North Dakota to Yorktown, Va. CSX confirmed with OGJ on Feb. 17 that the train carried Bakken crude. All of the oil cars were CPC 1232, newer model tank cars that were modified from DOT-111 tank cars to address safety concerns. The cause of the derailment is under investigation. In a release from CSX on the evening of Feb. 16, the company reported that it’s working to contain oil found in a creek that flows parallel to CSX tracks, and water utilities on the nearby Kanawha River are taking precautions. Fires around some of the cars have been allowed to burn out. CSX teams are working to deploy environmental protective and monitoring measures on land, air, and in the Kanawha River. The company said it’s also working with public officials and investigative agencies. One person was being treated for possible respiratory problems, but no other injuries were reported, the company said. ← What are natural gas liquids and how are they used? American railroad executives have fallen into greedy habits calling for ever more difficult operating scenarios: longer trains, heavier axle loads, faster speeds, heading to the day when locomotives & trains are remote controlled from Omaha or Chicago or Reston VA 20190… Main tracks once inspected daily by trackwalkers develop loose spikes and washboard patterns before repairs can be scheduled . Single track lines make repair windows much shorter than when double mains were the rule. A sad demise for railroading coming when container ports are rendered moot by Middle East meltdown & subsequent deflation of the World Trade Bubble. About 40 years back wiser heads saw railroads as America’s most sensible ways & means to effect Energy Independence! Local rail links and branch line rebuild was contemplated in early days of OPEC, but the military minds trumped that approach. Rubber tires and cheap oil all the way! America as a Dream and a viable Union of States has only limited time & resources to refocus early mission as key player in the World Food Basket role: that requires massive water resource development like NAWAPA to recharge primary aquifers. North American Water And Power Alliance can be segmented among the Western States, creating very durable water supply grid to permit much needed de minimus agricultural guarantees for Western & Asian Allies. This must be Job No 1 for the Western Alliance! Agriculture in a well watered scenario demands rebuild of thousands of miles of ripped up US & Canadian bread basket rail branch lines: shorter & more frequent trains, needing more employees per ton-mile than presently.the case. How badly do we free nations want a new era of food & energy security? .Or simply continue plunging further into WWIII, head butting Putin, letting Iran have the bomb and watch Saudi oil fall into hands of maniacal minions of Mohammedanism? Famine is a greater concern than long lines at the gas pump, boys & girls.